Every day you see thousands of motorhomes cruising down the interstate, towing a car or dingy on a tow bar or tow dolly behind them. This isn’t the only way to provide an alternative way of getting around, once you’ve arrived at your destination. In many instances, it’s not even the most cost effective way. 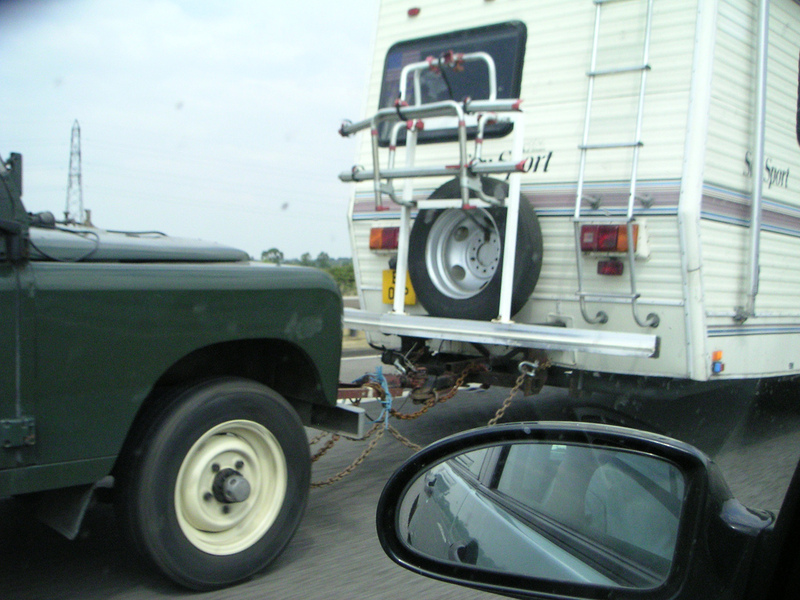 Let’s take a look at the pros and cons of towing a car behind your motorhome. Then let’s investigate renting a car when you get where you are going instead. You may be surprised which option makes the most sense. When you get to your destination, be it for a day or a month, you can sightsee, shop, visit relatives, etc. at a fraction of the fuel costs of driving your motorhome. You’ll have the freedom to come and go as you wish; your motorhome doesn’t need to be moved. This means you can leave your campsite set up, while you’re off doing whatever it is you need or want to do. Your toad (towed car) can also act as additional storage space. Extended voyages often mean you don’t have enough onboard closet space. Adding a clothes rod across the back seat can expand your wardrobe nicely. In the event of a breakdown on the highway, your escape pod is right there with you. It’s a simple matter to unhitch the car, and drive for assistance. You can forget about reverse gear, because it’s practically impossible to backup a motorhome when towing a vehicle on a towbar. Almost immediately, the front wheels on the towed car will turn all the way to the stops — probably in the wrong direction. This means if you try to go further, you will be dragging the car and causing extreme stress to steering components. This will get costly very quick, because your car wasn’t designed for this kind of abuse. Unless you have installed a speedometer or driveline disconnect, many cars will continue to rack up mileage when towed — even with the motor shut off. This could adversely affect the car’s resale value. You may experience poorer mileage on your motorhome, because now the RV’s drivetrain is moving two vehicles down the road, instead of one. In most instances the car being towed is narrower than the motorhome. Unless you have a rearview monitor/camera, you’ll have no idea what’s happening with the car you are towing. If it should happen to break loose, you may not even realize it’s gone. I’ve known of more than one towed car that caught fire, because the motorhome driver was unaware the car had a flat tire. Liability is another issue not to be taken lightly. If your toad does break loose, you will be responsible for whatever damage it causes. Plus, in a bad accident or fire, you could be losing two vehicles instead of just one. You will have the expense of a proper tow bar, safety chains or cables, and proper lighting at the rear of the car. Equipping a vehicle to be towed can easily cost over $1,000. Cost and upkeep of your dinghy is no small item either. You must keep a minimum of liability insurance on it — even when it is being towed. Plus, there is servicing and repairs to consider. If you’re planning on buying a vehicle specifically to be towed, you can count that expense as well. Some states require that there be a way to activate the brakes on the vehicle being towed. That’s another costly expense, just to meet the legal requirements. Not all cars can be towed on their wheels. Check with the manufacturer, before assuming any vehicle is capable of being towed. Overall, you can see that towing a second vehicle can be a costly proposition. There may be a more cost-effective way to get around when you get there. Renting a car, as you need one, makes sense for many RVers. By renting a car at your destination (or anywhere along the route for that matter), you can come and go as you please. All those pesky expenses of set up, and maintenance just go away. You can relax, and enjoy your driving time, instead of constantly watching the monitor to make sure the car is still behind you. Instead of dragging that car with you everywhere you go — just for making occasional short trips more convenient — you can choose to rent a car for those times you really need one. Car rentals are available in almost every city large enough to have even a small airport. 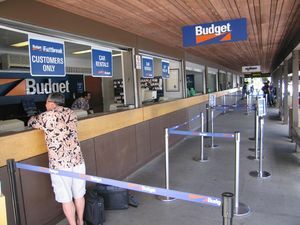 In fact, near the airport is the most likely place to find car rental agencies. You do have the inconvenience of picking up and returning the car, so having another way to run to the corner store for that gallon of milk might be handy. Carrying bicycles (or even a small motorcycle or scooter) on the back bumper of your motorhome can pick up the slack, for times when renting a car isn’t practical. When we were full timing, I towed a small car, and carried a Honda motorcycle, because we both worked and we tended to stay in one place for extended periods. 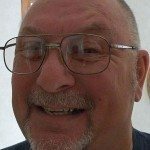 I can definitely see that if I was going on vacation or traveling, renting a car now and then would sure be simpler, and overall cheaper, than towing a dinghy behind my motorhome all the time!